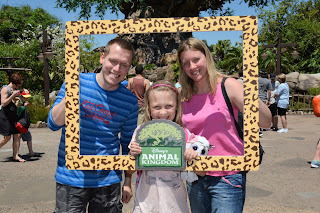 I really like this park especially the Kilimanjaro Safaris ride at Disney and that was Little Miss P's best ride too. I think we ended up going on three times in the week we were there and we went all at different times of the day so we saw the animals doing different things each time. I would have loved to do a late night ride but they don't do them. 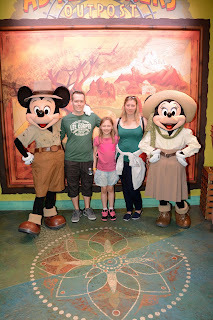 We also met Mickey and Minnie here at Adventurer's Post and they look so cute in their outfits. You can also do a Wilderness Explorers Trail where you can become a Wilderness Explorer and collect stickers around the park. Little Miss P loves doing this kind of thing. One ride we went on that Little Miss P HATED was It's Tough to Be a Bug. It had some creepy crawly moments in the dark where it feels like the bugs are running under your bottom, it feels horrible. We even had Little Miss P crying through it, that's how much she hated it. I think we got the best photos from this park. I loved all the ones from the photo pass. We spent one whole day in the park and a half day as the other bit of the half day we spent by the pool. I also loved the the Lion King show, that was great. That's all have to say about Animal Kingdom, I loved it.